The MX-23 is the most forgiving iron available. Mizuno engineers produced the MX-23TM to have an even lower, deeper center of gravity and larger sweet area. MX-23 are good but not great. Difficult to control distance. Shots that feel perfect are often 10 yards short or too far. Feel is great. Offset is good for a game improvement iron. These are not your typical game improvement irons. They look similiar to a players iron, but are slightly oversized. Workability is about 10 yards either way. Overall, good but not great. Mizuno Mx 23 are the best selling Mizuno irons of all time and I can see why. Mizuno makes the best irons in golf and these are the best selling irons for that company so I had to give it a try. Even though they are very hard to find and very rare if you can find one in good condition if the stores have them, I found a good set on Craigslist for 8/10 condition for 250 bucks. Tried them at the range and these clubs are money! That typical legendary Mizuno buttery feel everyone talks about is beautiful. I will never go for another iron company ever again. These clubs are money. Thats all you need to know. Like many other golf addicts, I've tried every club I can think of. Some of them twice. These MX-23s are absolutely the best. Longer, easier to hit and more accurate. You can spin the ball, which is hard for us hackers. If you can find them on ebay(like I did for $200) in mint condition, jump on them. One point: I don't see how you can suggest they're not for a mid or high handicapper. Play your own game. If it's been made, it's been played. I keep coming back to this iron after playing them in 2005 than switching to players irons in 06 mp 60s mp 57s mp 37s mp 32s. I now have 2 sets as there getting harder to find in nice shape. the mx 25 is pretty much the same club, but not as clean in appearance. By far one of the finest mizuno clubs made. Get them fit for you, and get ready to hit some of the best iron shots in your life. I consistently hit these clubs longer than just about any other club made. The feel is like no other, as pure hits theres no need to look where your ball is going, as its gonna be perfect. The weighting during a swing is very low and forces a nice smooth tempo. Ballflight is much lower for me than most game improvement clubs and very penetrating, and easy to work left or right. Spin is kind of high and allows you to go for the flag, as I can stop a 5 iron that hits most greens in a foot or two sometimes much less. There a little soft, so I wrap my towell around my irons to minimize bag chatter. Lofts and lies should be checked every year or two, as there easily corrected due to the forging. I have another set I am playing lightweight gs 75 shafts, there race, and posssibly longer yet and straighter due to the stiff flex, my other set is regular flex dg 300 and have a great feel with that shaft. Ping eye 2s, taylormade rac cb miura forged, mp 60s mp 32s mp 57s mp 37s mx 25s, lynx, taylormde burners,and many more. Very nice irons butery sweet spot beautiful looking irons, lots of feel and feedback. Not a whole lot of forgivness. Not recommended for the high handicapper but anyone uner 10 should be fine. I recently bought this set in VERY good condition off of ebay for $249 and I feel like I got the steal of the century. I have been hitting an older set of Cleveland TA7's since I first started golfing and have been fighting the biggest draw in the world. I played with these the first day I got them and I hit the ball farther and straighter and higher (though that was probably due to the stiff TX - 90 shafts installed). The clubs are very workable but still provide plenty of forgiveness on mis-hits. I easily hit a fade when called upon; something I had been struggling with using the Clevelands. I was literally amazed at how accurate they were. The long irons have a cavity back and the shorter irons have a more traditional looking muscle back. If you have a pretty consistent, repeating swing this club is for you. struggling with my clubs for monhts. Tried everything (TM 320, RAC LT, Titleist 775, Ping I3, Maxfli Revolution)and came out with these irons. FANTASTIC, they hit so easy,lots of feel and feedback. You can work with these irons, they have a classic look (dont like that bulky game improvers)en very forgiving. Dynalite shaft is ok. I paid 180 euro (is 220 dollars) a real bargain. Try these irons yoou won't regret it! Excellent irons, very forgiving, great for accuracy and workability. The happy medium between blades and cavity backs. I have just switched from the Callaway X20 irons. They were just not working. The clubs did not allow me to shape my shots. 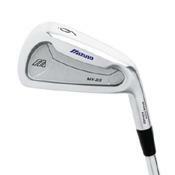 i started looking for a new set of irons and found the MX-23s i hit them and i emidietly fell in love with them. They are longer than anyother iron i have ever hit. the long irons are very good. I would recommend these to a good player who wants a good set of irons. I WOULD NOT recommend them to a high handicaper. Great iron over all!!!!!! !